sSNAKESs : Reptile Forum - Adopted Suriname boa very small? Adopted Suriname boa very small? I adopted a 2 year old Male Suriname redtail about a month ago from a shelter. When I got him, he was in a bad state, super underfed, and had shed from a few cycles stuck to him. I put him in a new terrarium with a fogger attached to a humidity controller and waited a week before feeding him. Started him off on a small mouse to let him build a bit of gut bacteria and now after a month he's taking an adult mouse with no issues every Sunday. After having his humidity up, his stuck shed got loose enough for me to give him a bath with zilla's shed ease and most of the stuck shed came off by itself after 25 mins and the rest came off as I let him move around between my fingers while in the water. He seems a lot more active and happier now in his enclosure. Having said everything, I still suspect he's very small for a 2 year old boa (I suspect he'sabout 3 to 4 feet but he's very skinny), and I am wondering if there is anything I could do in addition to regular scheduled feedings to help him reach adult size. Will he ever reach his potential size? Thank you! 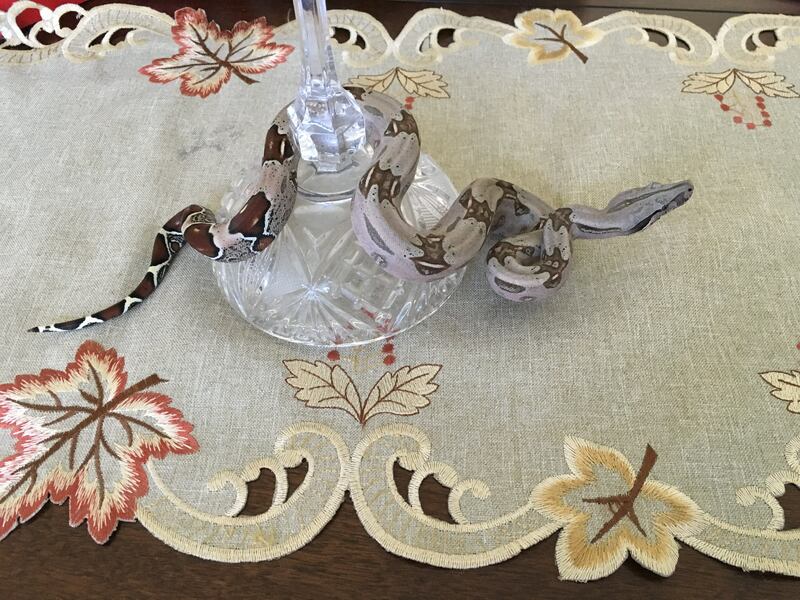 Re: Adopted Suriname boa very small? Congrats on your new addition! Do you have any photos you can post? 3-4 feet doesn't really seem that small for a 2 year old. 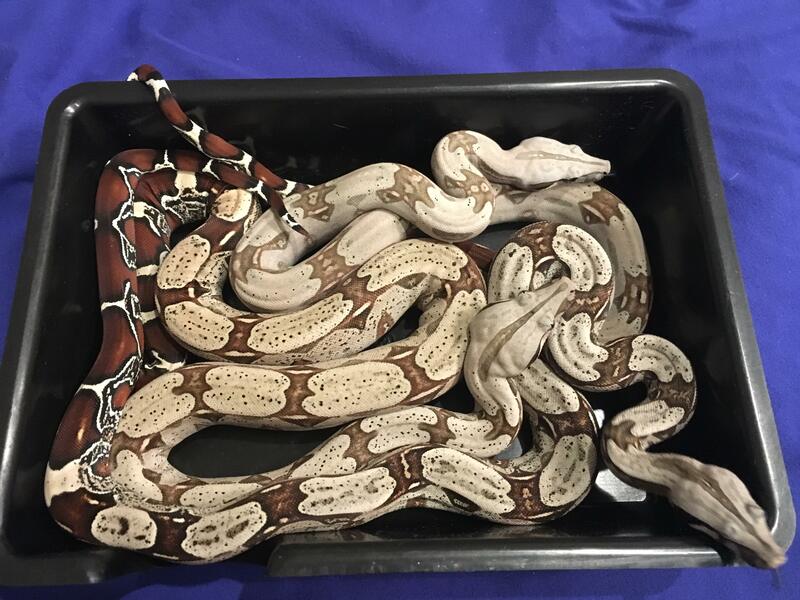 Boas do grow slower that pythons, in general. Personally, I'd switch him over from mice to rats when you can, continue what you're doing, then scale back the feeding once he is at an appropriate wait. Yup 3'-4' sounds a good size for his age, but considering he was underweight when you got him I'd still treat him like an emaciated boa. Slowly build up his prey size until he's up to a normal sized meal (my boas of that size are eating weaned or small rats). While he's underweight, weekly feedings should be ok, but once he starts looking good again, I'd scale back to a 2 week schedule. You don't want him to go from one extreme to the other. A healthy weight adult only needs to eat every 4-6 weeks, but at only 2 years he's still got a few years ahead of him before he gets that big. He still has plenty of potential to reach adult sizes, a properly fed boa doesn't reach adult sizes until 4-6 years old, and can grow noticeably for many years after that. I weighed him last week and he weighed 272 grams though he doesn't look super underweight. I will be able to get pictures of him tomorrow. I fed him on Sunday and i feel nervous about handling him for like 3 to 4 days after because he has a history of regurgitating (although the lady who had his medical history said that he hasn't regurged for more than a year). I'll take the pics once i take him out tomorrow! Btw the current weight of the food i'm giving him is about 19-25 gram (adult mice). I bought some small rats today that weigh around 40 grams each but i think i'll wait a while till he's a bit bigger to start him on those (maybe a month or more?) Thank you guys for helping! Here are some pictures from his bath today. He still had some stuck shed remnants. I did not weigh him today because by the end of the bath the water had cooled and he was eager to be back in his enclosure. I'll weigh him tomorrow. He looks beautiful but small for his age. If he was my boa, i would move him immediately to small rats for a month and then to medium rats and after that large rats. This advice is terrible. You cannot just say to move to small rats and move him to large rats ASAP without even seeing the snake. The snake is not large enough to eat small rats, and won't be large enough to eat large rats for several years. If it was the estimated 3'-4', small rats would be a good size, but it looks much smaller than that. The boa is small enough I'd hesitate to suggest even weaned rats. My boas of that size are eating large adult mice. He looks much smaller than the estimated 3'-4'. I think you should be fine sticking to the mice as you've been doing. :) He will gain weight and size with time. Do not power feed as Pedroo has been advocating. A stunted snake that is fed as much as you can put into them can cause a whole host of problems...I've even seen such snakes develop severely kinked spines. Take it slow and easy, and he'll grow with time. He looks fairly close to the size of my almost 2 year old male Suriname. My guy is turning 2 in August and is on adult mice every 2 weeks. The bcc just seem to grow slower than the bci. My bci around the same age as him can take weaned-small rats and I feed everyone the same way. He will grow just fine no need to worry and throw food at him. If he has a history of regurgitating I definitely wouldn’t rush him with large food items or feeding too often. Thank you everyone, I will keep him on the mice until he gets bigger. I know the images (due to perspective) make him look shorter than he actually is. I measured his length with a tape measure while he was extended on my table and he was 3 feet and 5 inches. His girth hasn't caught up yet. I'm glad to know that he's on the right track though! I will update you guys as he grows or if anything interesting happens! Good luck! Yeah, his girth should catch up as he matures, I wouldn't really expect too much girth while he's so young and small. As riddick said, BCC seem to grow much slower even when BCI are fed the same way (there are always exceptions but that seems to be pretty common). Yeah Inara turns one in August and she’s just as big as the other 2 bcc that are turning 2 in August and September. The babies in that litter came out big! All 3 together. The darkest one is the youngest. Her mom was a first time, big older female. These two next to each. 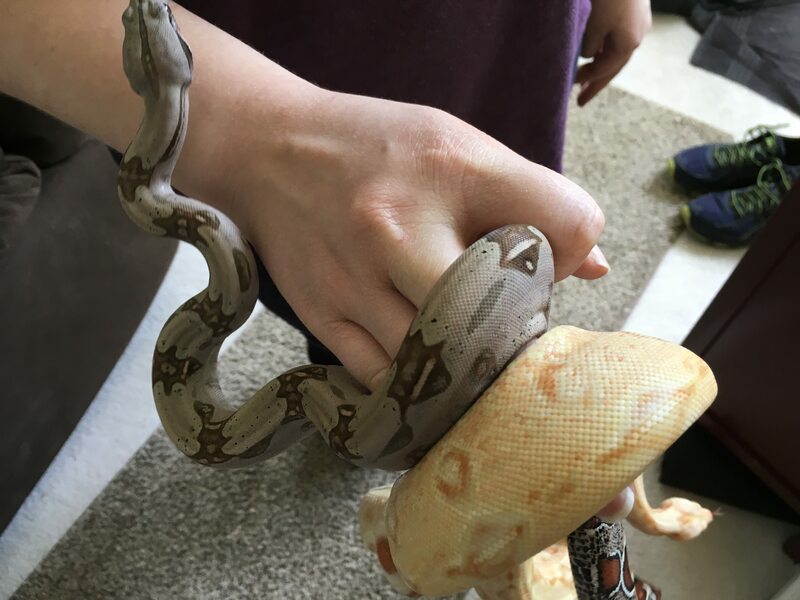 Both turning 2 soon and fed the same way, plus the albino is a Het Leopard so there’s a little dwarf floating around in him. Not that the dwarf shows anymore for him lol it is interesting to see how different everyone is growing even fed the same. The bcc boy isn’t that much shorter than the other one. He’s just lanky and doesn’t have as much mass yet. Wow Riddick your snakes are gorgeous! Anyway you guys have put my mind at easy! thank you!